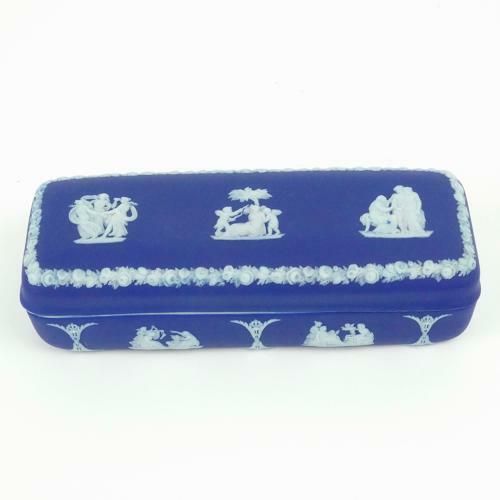 A large, Wedgwood, dark blue jasper dip, rectangular box and cover. This piece is marked ‘WEDGWOOD MADE IN ENGLAND’ and it dates from c.1920. There is also an impressed letter ‘O’. This would have been part of a dressing table set. The base is decorated with a series of classical scenes which all include cupid, or cherubs at play, divided by anthemion, and the lid is decorated with three further classical subjects and a border of flowers. All of the reliefs are good quality and the jasper dip is a good, rich shade of blue. It is in excellent condition. Price includes postage with the U.K. Shipping to the U.S.A. add £15. Western Europe add £7.